As of April 2019, recreational marijuana is legal in 10 U.S. states and medical marijuana in an additional 23. Despite the substantial departure from long-standing drug policy which this represents, until quite recently there have been relatively few direct studies on the mortality implications of marijuana use in the general population. While the scientific consensus remains incipient relative to other well-established underwriting criteria such as tobacco, a review of the available literature, in concert with ExamOne’s own original research, does reveal a number of emerging consistencies on the magnitude and origin of marijuana risk from a life insurance underwriting perspective. Last year, ExamOne completed the most comprehensive review of marijuana mortality risk in an insurance applicant population that we have undertaken to date. With over 1.7 million not-for-cause urine screens for THC, and 8,100 deaths, the study was designed to probe the interaction of marijuana use with applicant age, gender and tobacco status. Indirect lifestyle correlates – including other recreational drug use and some observed increase in high-risk infectious disease (HCV and HIV) prevalence. Interestingly, both categories (2) and (3) would probably be expected to generate disproportionate risk in males. 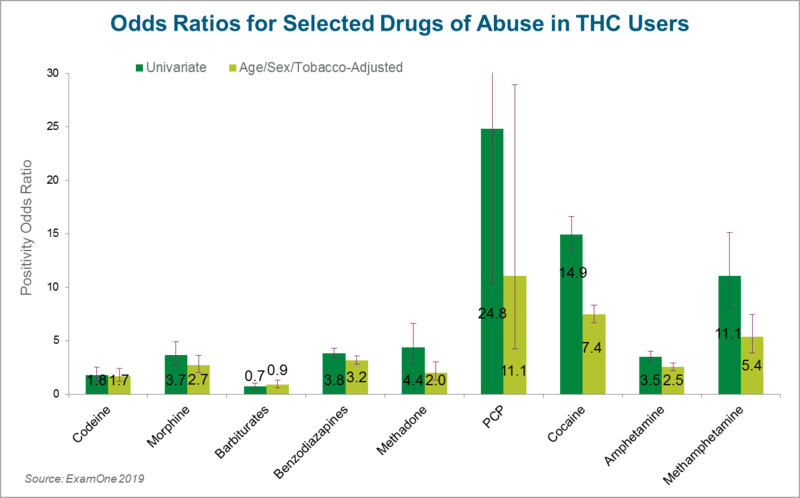 Additionally, ExamOne data does seem to offer some support to the lifestyle correlates thesis; in our data, THC positivity was positively correlated with all tested drugs of abuse except barbiturates. While some of this correlation is attributable to demographic factors (e.g., the heightened tendency of young males to use both THC and cocaine), the relationships persist even when controlling for this effect. Odds ratios were notably higher for illegal drugs (PCP, cocaine and methamphetamine), reinforcing the notion of a meaningful sociocultural barrier between legal and illegal drug users. 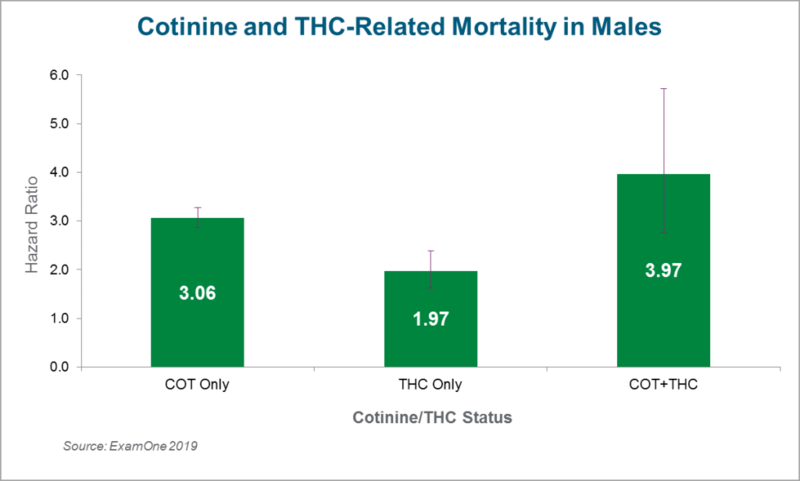 It should be noted, however, that the PCP correlation likely reflects the fact that smoking marijuana/PCP combinations is among the more common consumption modalities for PCP – it is more a fact about (very rare) PCP users than (much more common) marijuana consumers. 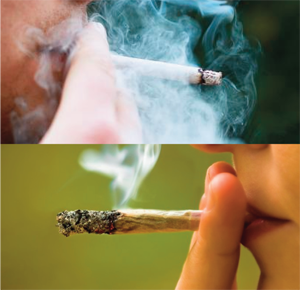 While ExamOne generally lacks the data to directly test the behavioral effects hypothesis, a growing number of studies have established a statistical link between marijuana legalization and state level motor vehicle accident rates.2 The Highway Loss Data Institute estimates that legalization is associated with a 6% increase in collision rates; if these excess collisions are concentrated among male users, then impaired driving alone could plausibly account for the bulk of the two-fold increase in risk noted in the ExamOne findings. While marijuana use might still prove to be a long-term mortality risk in its own right, the most immediate and well-established risk factors for the drug appear to be its correlation with impaired driving, and the abuse of more inherently dangerous illegal drugs. Particularly when underwriting male users, insurers are probably well advised to pay careful attention to driving histories, and any indications of broader recreational drug use. For more information on drug positivity rates in the U.S., read about Quest Diagnostics’ latest publication of the Drug Testing Index™ (DTI). The DTI, which is the country’s foremost analysis of workforce drug use, found the rate of workforce drug positivity hit a 14-year high in 2018. 1Sidney S, et al. Marijuana use and mortality. Am J Pub Health. 1997;87(4):585-590. 2HLDI Bulletin. Recreational marijuana and collision claim frequencies. 2018;35(8):1-14.